Out riding MV Agusta’s Brutale 800 Dragster and Dragster RR it was only fitting to start with the regular Dragster. Don’t be deceived here either, the RR is a different beast than the regular Dragster and not just from a cosmetic or suspension standpoint either, but onto that later. 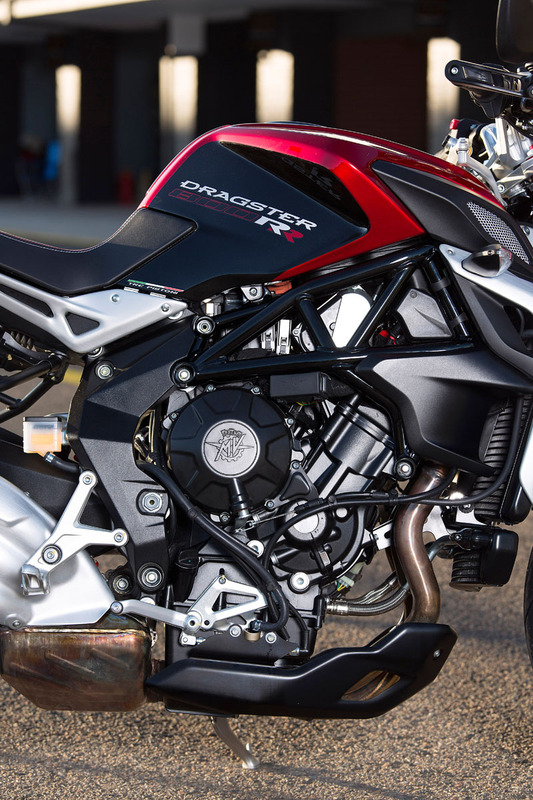 The Dragster is seriously cool looking in my opinion, it’s obviously a Brutale but even more trick than the regular options, thanks to a more aggressive and slim tail that helps the rear wheel dominate the bike’s looks, with a revised wheel design and larger width rear wheel. Apart from these and a few other slight differences, like a different front guard, added lower header panels and instrument surround, the regular Dragster shares most of it’s features with the Brutale 800, from the 798cc DOHC three-cylinder four-stroke engine with counter-rotating crankshaft, with an output of 125hp to it’s wheelbase and weight. 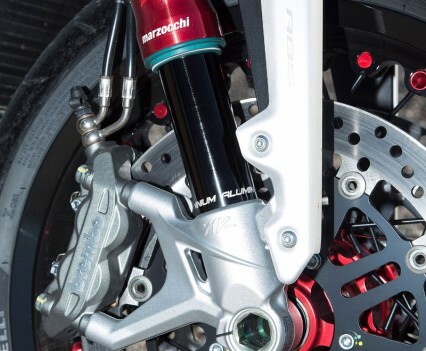 Marzocchi USD forks are fully adjustable and a Sachs shock is mated to the single-sided swingarm, with plenty of adjustability. The Dragster and RR share most of their looks, with the RR boasting spoked wheels and the schmick paint scheme. Jumping onto the Dragster it’s noticeably small, not in a cramped manner, reach to the pegs and bars is ideal for my 180cm height and proportions – especially for a naked and remains sporty, rather than the more super-upright and high ‘bars approach some bikes seem to be adopting recently. Gripping the tank is easy and natural, with a good balance between the seat, pegs and tank, allowing me to easily ‘lock’ into the bike. The wide ‘bar end mirrors provide reasonable vision but really aren’t ideal as they make filtering all but impossible. They do flip back in but I’d be swapping them for something a bit smaller that didn’t add any addition width to the bike. Electronics are extensive in the form of MV Agustas Motor & Vehicle Integrated Control System (MVICS), with Ride-by-Wire and four maps which offer fine tuning of the adjustable Engine Response, Rev Limiter, Engine Torque Response, Throttle Sensitivity and Engine Braking settings, as well as adjustable traction control and Bosch ABS with Rear Lift-Up Mitigation. To say there’s a huge level of adjustability is an understatement, so it’s important to realise with a day of testing it just wasn’t possible to work through all these settings – you’d probably need a few weeks if you wanted to really test the system out fully, while the regular modes give some good baselines. With that said there’s a huge level of customisability to fine tune both these bikes to your expectations, riding style and local conditions. 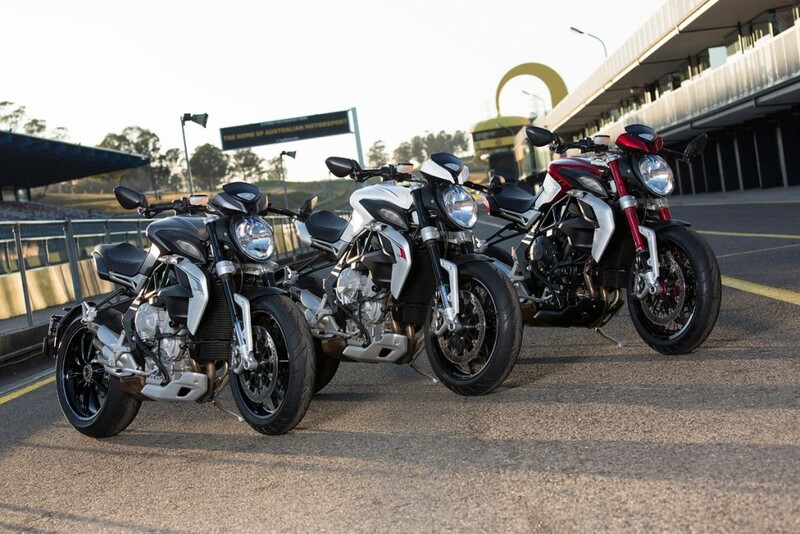 The Brutale 800 Dragster I was on was in Sport mode and was on rails despite the wide rear tyre, the engine was super responsive with incredible power generation – it spooled up incredibly fast and incredible torque and acceleration was available right from down low. 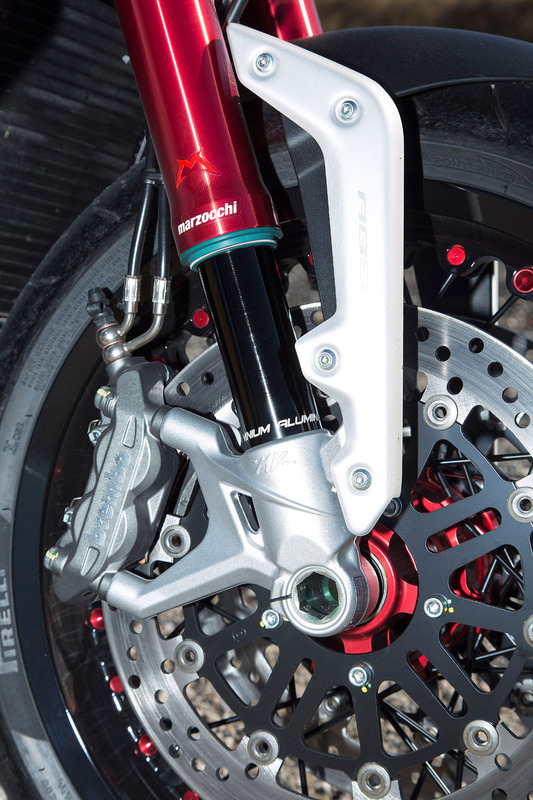 Power is light-switch, with the lightweight internals helping power build quickly but also meaning you carried less engine momentum when coming off the throttle. It was much like the F3 800 but smoother and a little more refined, without the F3’s raw edge. I liked both a lot but they each have their own distinct character. I did find transitioning off power could be a little rough at times, but this was without touching any of the engine settings and in Sport which is more aggressive. It was by no means a game breaker either, it was just noticeable in certain circumstances and RbW is always more sensitive to throttle input. The Dragsters are great through the curves with the RR benefiting from better fueling which helps in rougher conditions. Suspension was a definite standout – I’m only about 75kg in gear but over the vast majority of surfaces it was comfortable without being overly harsh. In the smooth corners it was perfect and provided absolute feel and confidence. 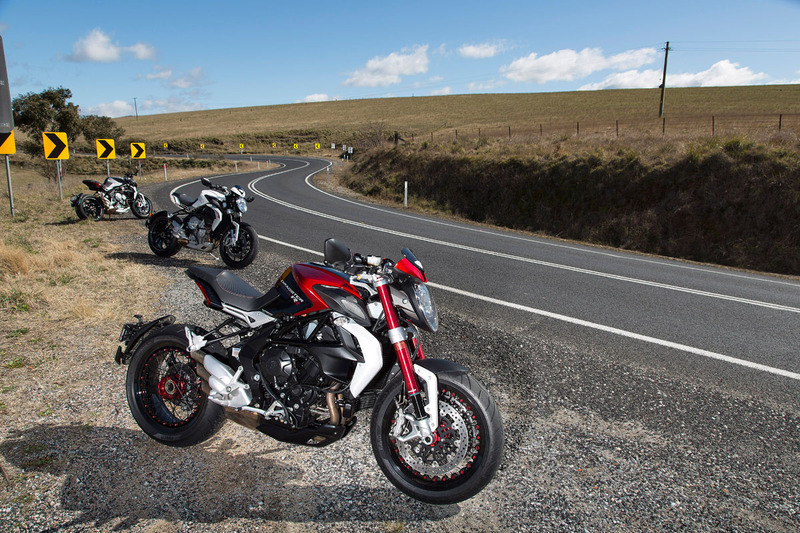 Over some really badly damaged sections though it would be overwhelmed as it was more angled towards sporty riding on smoother roads, rather than as a tourer – which let’s be honest is what you expect. Your mileage may vary though depending on your weight, preferred setup and how closely you match MV’s idea of who would be riding their bike. I didn’t touch the adjustment and found the suspension very close to where I’d normally prefer it. The seat was also really hard and not the most comfortable if you’re planning on clocking up the kays though. 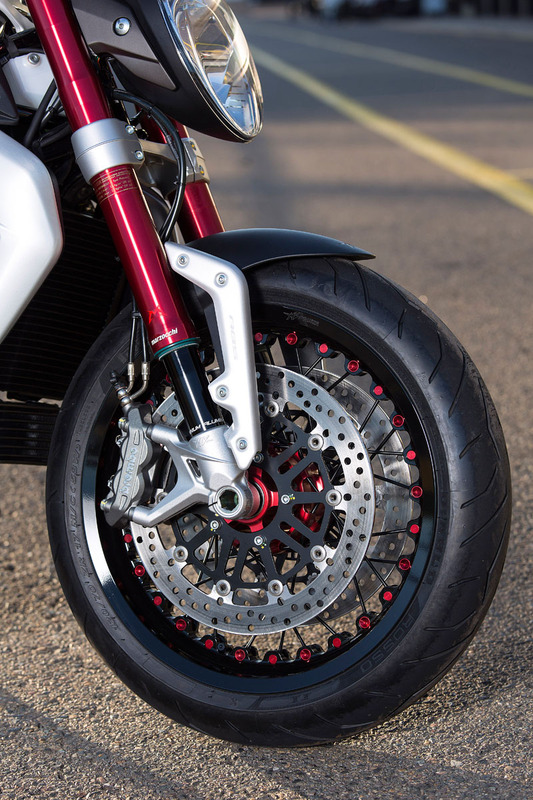 The Brembo brakes also merit a mention – it’s not that you normally find them wanting, but they were very well balanced for the bike, without excessive bite and complemented the handling and engine perfectly, they did their job extremely well, front and rear. No fuss, no bother, no worries and no ABS intervention in the cool but dry weather we had, even when braking aggressively. 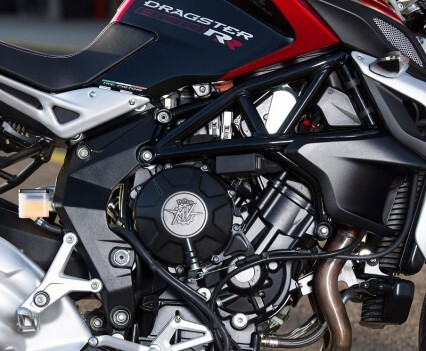 Now keep in mind the Dragster 800 RR shares its chassis with the regular Dragster, albeit with the eye catching red anodised fork legs, so the exceptional handling, brakes and ergonomics are all shared with the Dragster. The Dragster RR was the clear winner for me with the extra injectors and newer ECU system ensuring exceptional fueling. 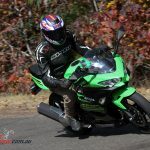 The biggest difference is however with the engine, with the RR boasting an additional 15hp for 140hp total, as well as an extra 5Nm of torque, albeit much higher in the rev range. The RR benefits from an updated computer system, boasting the MVICS version 2.0 system, with six injectors, or two per cylinder in comparison to the regular Dragsters three (one per cylinder). It also uses a 50mm throttle-body instead of the 47mm item found on the regular Dragster. 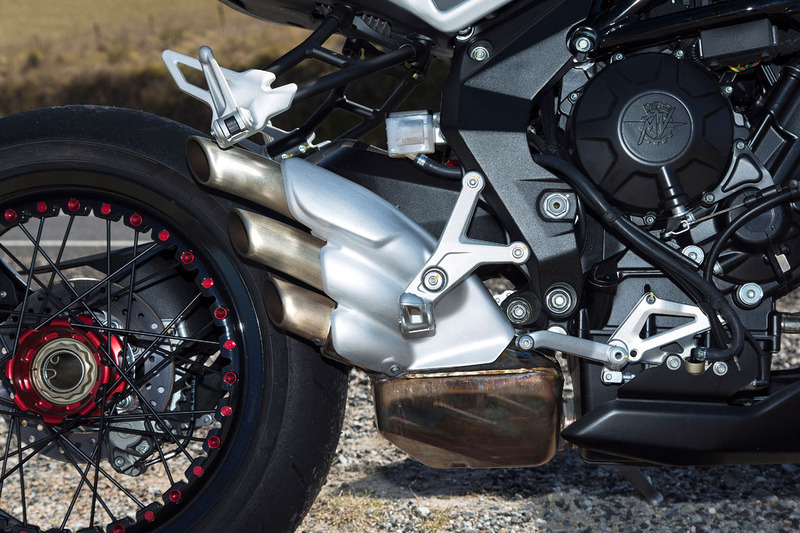 The difference was incredible to be honest, with the RR feeling much smoother on and off the throttle, particularly on deceleration where the MVICS 2.0 system felt much more refined. 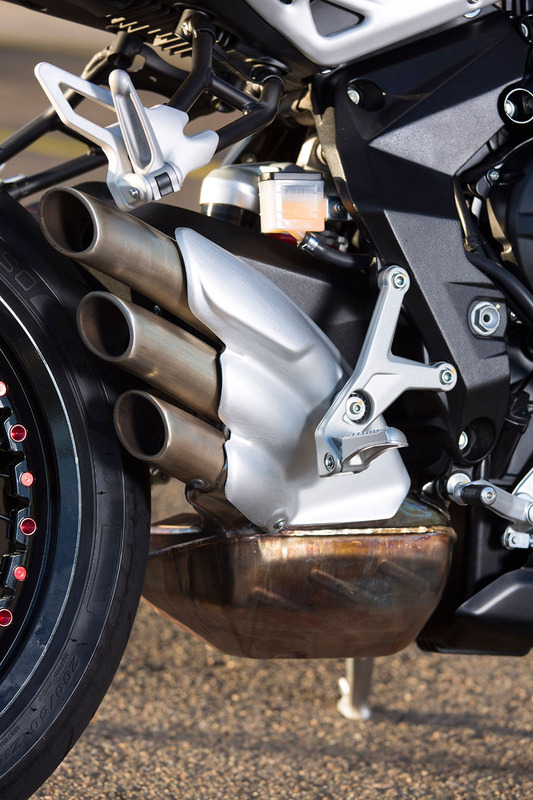 Power is already incredible on the Dragster and I wouldn’t say it felt considerably more so on the RR but the level of control on offer was just exemplary, on par with the BMW S 1000 RR which is extremely high praise – pretty much the highest I can give for RbW to be honest. 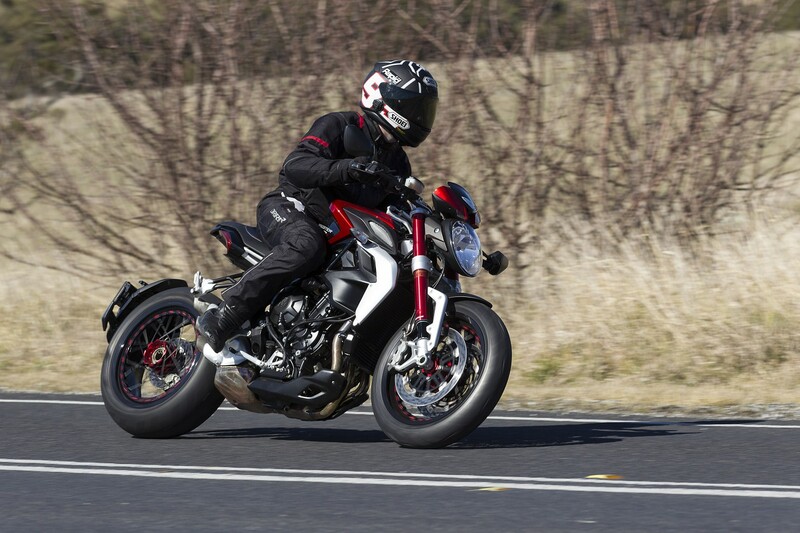 This was also in Sport mode, with the RR benefiting from an updated MV Electronically Assisted Shift (MV EAS) quickshifter which will not just operate on upshifts but also on downshifts – very snazzy and it worked without issues during my time on the bike. 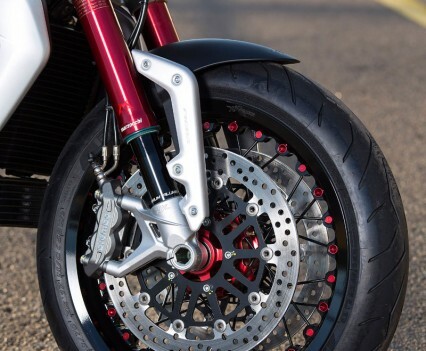 Having tried the RR I’d be hard pressed to pick the regular Dragster over it and that’s despite the fact I’m not really a huge fan of the spoke rims – I’d prefer the regular rims both from a looks and cleaning perspective! 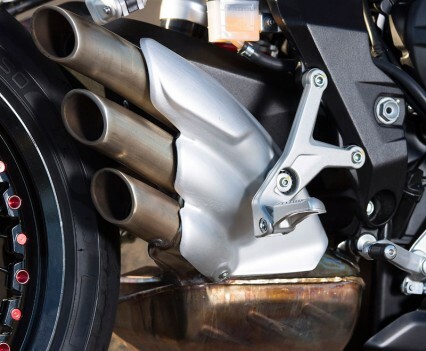 But the RR truly is the next evolution of the Dragster engine and that refinement is easily felt and experienced, especially riding the bikes back to back. The MV Agusta Brutale 800 Dragster is $20,499 plus on road costs, while the Dragster RR is $22,999 plus on road costs. 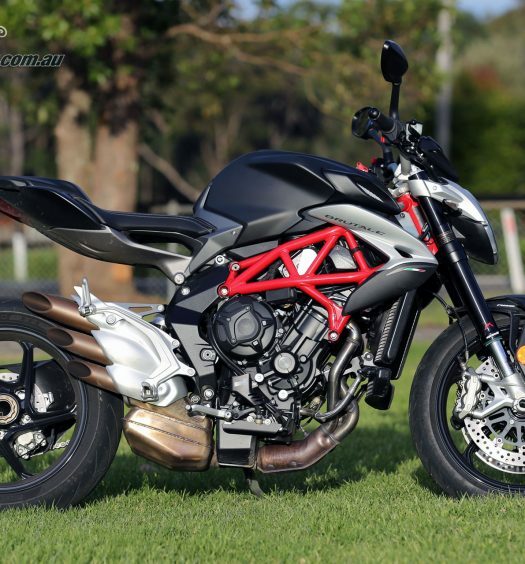 I highly recommend giving both a try if you’re looking for your next machine, particularly the MV Agusta Dragster RR! Holy moly. It is not that often I go stupid on a bike but the Dragster totally brought the idiot out in me. 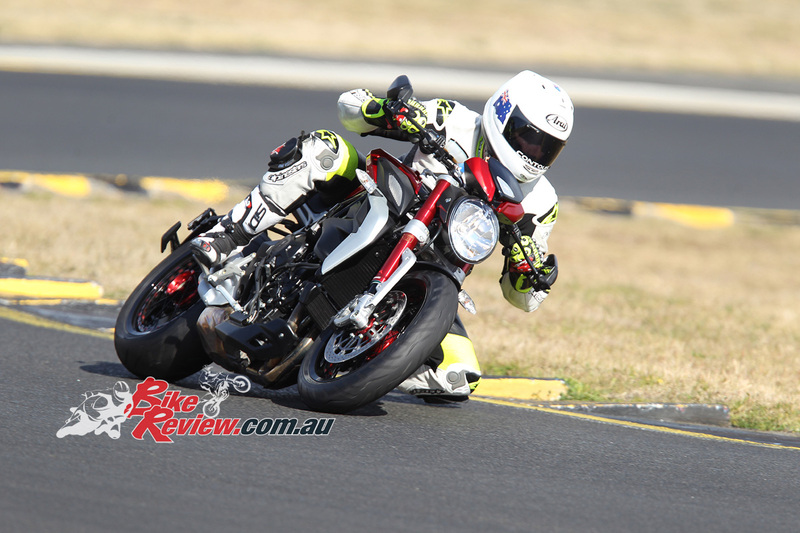 Within a lap of Sydney Motorsports Park I was stunned. I looked at the Dragster in the pits and truth be told wasn’t that keen on riding it on the track. It just doesn’t look like a bike that would like the track. How wrong I was! 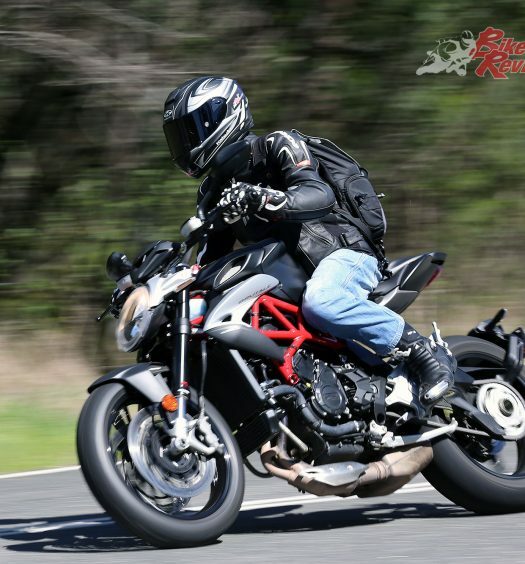 The Dragster is one of the most fun nakedbikes I have ever ridden – it is small, powerful and handles great – it is also fast. Really quick. 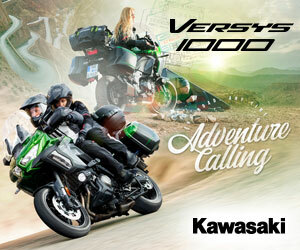 In fact, I got 245km/h out of it on the chute -without tucking in as the bike is too small for that. Compare that to the top speed of 260km/h I got from the F3 800 on the same day and you see how quick the Dragster is. Steering is pin sharp and lightening quick. 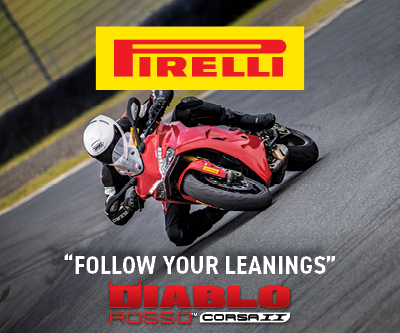 You can carry decent corner speed but are limited by poor ground clearance even by nakedbike standards. The tiny seat-to-bar distance and angled seat means you are also jammed in position so it is hard to hang off or shift weigh for and aft to balance the bike, but those things aside, the Dragster is a ball tearer and I had serious fun with Kevin Magee – who was on the Dragster RR. 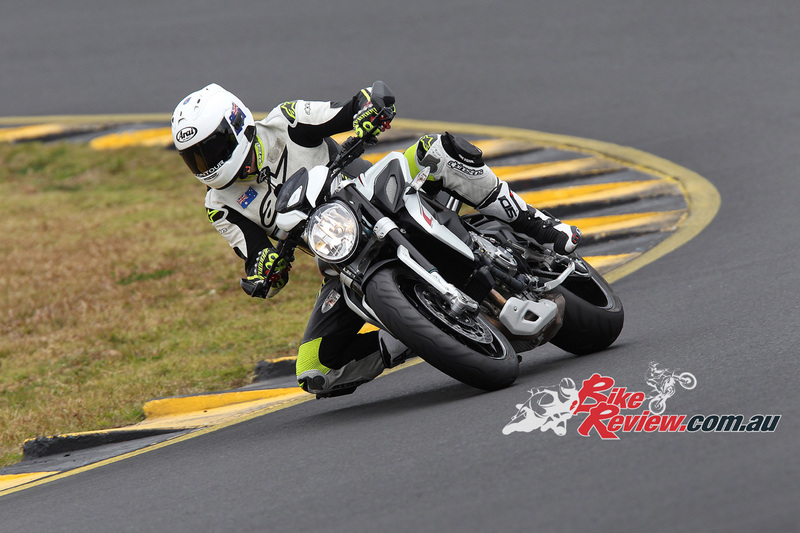 We diced hard and went bananas – then swapped and I rode the RR. The up and down shifter was sensational and the extra horsepower insane. Incredibly, I got 255km/h from the RR on the chute (Magoo got 260km/h!). 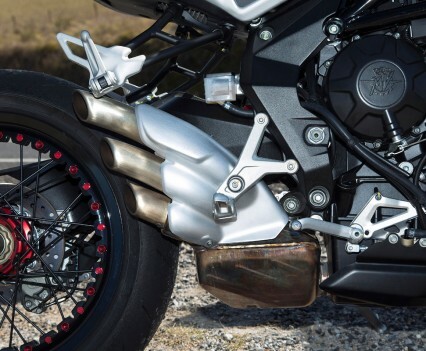 Like the Dragster standard, the RR handles brilliantly for what it is and really stunned me on the track with grunty punch off turns, brilliant brakes and grip, plus a good top-end whack. The only issue was some inconsistency with the quickshifter, which cuts ignition for too long and causes dramas in the lower gears.